Last post for today - I promise! I enjoy starting my week off with the CPS Sketch, gets my mind creative! Click here to view this weeks CPS Sketch. I decided to rotate the sketch for my card this week. I adhered my strip of Parisian Breeze to my Chocolate Eyelet Border, then to the Baja Breeze base card. The leaves from Kindred Spirit are stamped in Chocolate so the branch flows over the sentiment, the butterfly was popped up for dimension. Thanks to CPS and Linda Beeson - CPS Designer and sponsor of CPS106, as my card using sketch 106 was chosen as last weeks winning card! Finished Size - 3-1/4" x 6-3/4"
What a classy & fresh look! Love it! Great sketch. I am loving that color combination too. 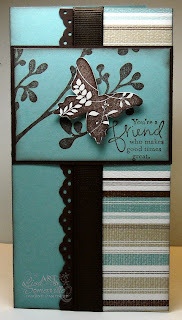 you are rockin' those butterflies...i loved last weeks card, and this one is too cute as well! oooooooh! Lisa, this is pulchritudinous!!! I love how this turned out! When you see my card later this week you will see that I turned mine like that. Love your use of the CPS sketch. Such a beautiful card!! I love the stamping you did! Great job with sketch 107...thanks for playing at CPS this week! Hi Lisa! Great card...as usual! I just found the CPS challenge tonight, so decided to try it. I especially love your choice of colors. How fun are you turning the sketch. LOVE IT! Your card is lovely! Great choice on the colors!